The 2012 USA Pro Challenge got off to an exciting start, as the riders traveled the 125.7-mile route from Durango to Telluride where Tyler Farrar (USA) of Garmin-Sharp-Barracuda ultimately took home the stage win after a battle to the finish. 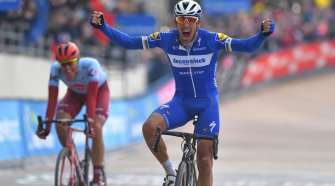 In a difficult first stage complete with two Waste Management sprints and three Nissan King of the Mountains competitions, the day ended with an all-out sprint to the finish, which saw Alessandro Bazzana (ITA) of Team Type 1-SANOFI take second and Damiano Caruso (ITA) of Liquigas-Cannondale claim third. 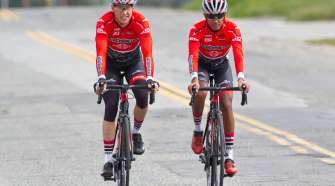 Comprised of 16 teams and 124 riders, which include reigning champion Levi Leipheimer and 2011 Tour de France Champion Cadel Evans, the field for the 2012 race started the day with a bang. After heading out of downtown, the riders approached the first Waste Management sprint in Durango, which was taken by Nathan Haas (AUS) of Garmin-Sharp-Barracuda, Javier Eduardo Gomez Pineda (COL) of EPM-UNE and Martin Velits (SVK) of Omega Pharma-QuickStep. And with the sprint came the first breakaway of the day consisting of a decent size group of 22 that included Garmin-Sharp-Barracuda riders Tom Danielson (USA), Peter Stetina (USA) and Dave Zabriskie, as well as Jens Voigt (GER) of RadioShack-Nissan-Trek and Vincenzo Nibali (ITA) of Liquigas-Cannondale, among others. Followed by a chase group and the peloton, they approached the first Nissan KOM of the day, Hesperus, a Cat. 3 climb that took the riders up to 8,224 ft. First to the top was Andrew Bajadali (USA) of Optum Pro Cycling p/b Kelly Benefit, followed by Freddy Orlando Piamonte Rodriguez (COL) of EPM-UNE and Matt Cooke (USA) of Team Exergy. 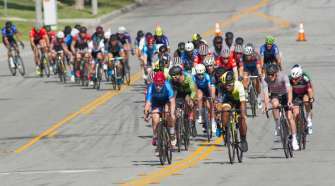 With a break that reached up to more than five minutes, the riders headed toward the second and final Waste Management sprint line in the town of Dolores. Motivated by the cheers of fans lining the sprint, Serghei Tvetcov (MOL) of Team Exergy took the max points, followed by Josh Atkins (NZL) of Bontrager Livestrong Team and Voigt. After an attempted attack by Nibali and Danielson, a group of 10 riders formed off the front heading into the next KOM of the day – Lizard Head Pass (10,222 ft.) – as the chase group was swallowed back up into the peloton. Danielson pulled away to take the KOM, with Eduard Alexander Beltran Suarez (COL) of EPM-UNE and Nibali following close behind. With only six miles until the next and final KOM at Alta, Danielson and Stetina pulled away to take a 35-second gap over the rest of the break heading over the pass. Results for the KOM were Danielson, Stetina and Beltran. With less than 10 miles to the finish, the riders stepped up the pace heading into Telluride. The gap was closed, followed by a short-lived attack by the Kings of the race –Edward King (USA) of Liquigas-Cannondale and Benjamin King (USA) of RadioShack-Nissan-Trek, and the field was brought together again for an all-out sprint to the finish in front of huge crowds of cheering fans. And in his first victory in more than a year, sprinter Farrar pulled out the win. In a near sweep of the jerseys for Garmin-Sharp-Barracuda, Farrar took the Exergy Leader Jersey and the Waste Management Sprint Jersey; Danielson took the Nissan King of the Mountains Jersey; and Stetina claimed Evolve Most Aggressive Rider Jersey. Gavin Mannion (USA) of Bontrager Livestrong Team was awarded the Aquadraat Best Young Rider Jersey.